The Intel Pentium G3258 20th Anniversary Edition Processor was a very fun processor to use and we are extremely happy with the results of our testing. This processor won’t out perform the mighty Intel Core i7-4770K or Core i7-4790K Devil’s Canyon, but we found it to be a very affordable chip that was an excellent overclocker. If you are on a strict budget, looking to build a Steam Machine or just want something inexpensive to play around with, the Intel Pentium G3258 should be of interest. When it comes to gaming performance there are many games titles that people play that do well on dual-core processors and love high clock frequencies. An example of these game titles would be those using Source (think DOTA 2, Counter Strike: GO, TF2 and so on). If you are playing older game titles that aren’t heavily optimized for quad-core processors, the Intel Pentoum G3258 should prove to be an excellent little chip when overclocked to 4.4GHz and beyond. This processor would go great in a budget gaming build with something along the lines of an NVIDIA GeForce GTX 750 Ti ‘Maxwell’ video card, 4-8GB of RAM and a decent little CPU cooler. You could go crazy and stick a GeForce GTX 780 Ti in a system with this processor like we did in our Metro LL game testing, but you’ll be bottlenecked by the CPU. Overclocking performance was far from disappointing. We weren’t able to hit 5GHz, but we were able to hit 4.8GHz with full stability on our processor and that is awesome. We took a 3.2GHz processor and overclocked it by 1.6GHz! That is a 50% clock frequency increase on a low-end budget minded processor and enough to turn it into a single-threaded monster! 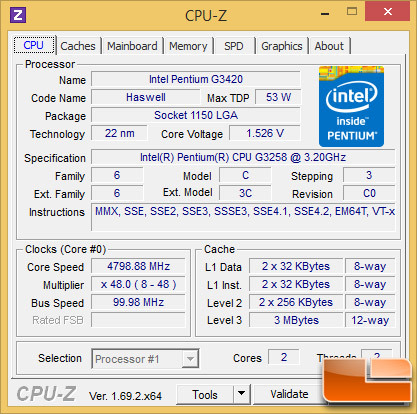 The Intel Pentium G3258 has mad overclocking skills and is begging to be overclocked. The 3.2GHz baseclock set by Intel is very conservative and this chip begging to be overclocked. We are very happy that Intel has finally allowed a processor to be unlocked outside of the K-series! It would have been nice if Intel included the Next-Generation Polymer Thermal Interface Material found on Devil’s Canyon processors on the Pentium G3258 20th Anniversary Edition Processor, but for some reason Intel decided against it. 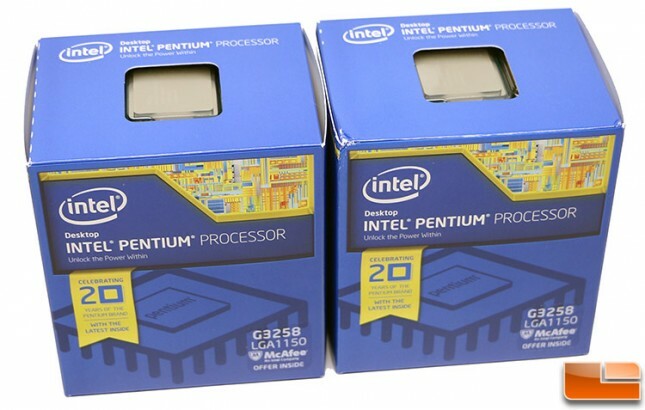 Right now the Intel Pentium G3258 can be purchased at Micro Center for $59.99 plus tax. That is where we bought our retail processors from and spent $65 each after taxes, which is a great price and below the Intel suggested tray pricing of $72. For those that don’t have a local Micro Center, you can head on over to Amazon and order one for $89.99 shipped. We expect that price to come down once the initial interest dies down a bit, but we have a feeling the Intel Pentium G3258 will be fairly popular. You can build a very inexpensive system with the Pentium G3258 and overclock the heck out of it. We an see the G3258 running well in a general purpose PC, Steam Machine, budget gaming rig and a zillion other builds. 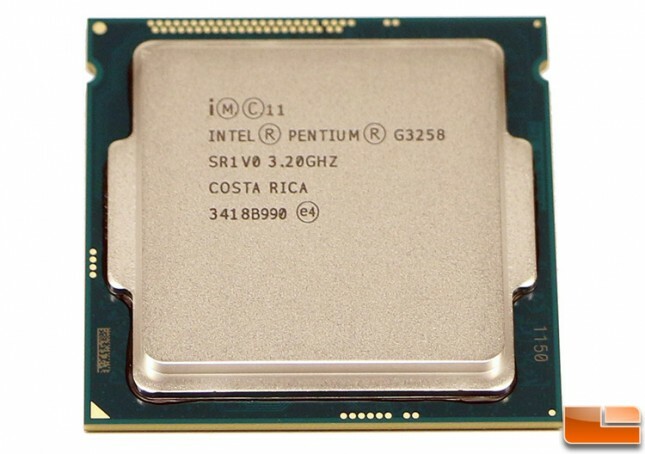 If you are looking for a budget-priced Intel Pentium processor that has serious overclocking headroom look no further than the Pentium G3258. The best part of the G3258 is that if you fry a chip or degrade one by overclocking for a long period of time, you can replace it relatively cheaply. I feel much better running more than 1.45V to a $65 Pentium G3258 than a $279 Core i7-4790K! Happy 20th Anniversary Pentium! 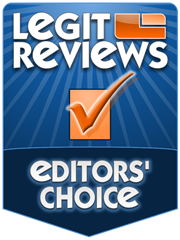 We will celebrate by overclocking the crap out of you and give you the Editor’s Choice Award! Legit Bottom Line: The Intel Pentium G3258 20th Anniversary Edition shows that Intel still has some love for enthusiasts and they have given the community an inexpensive chip that has serious overclocking headroom!